In one of our previous posts we gave you a few useful tips on distinguishing a good interior designer from an amateur. One of the most important advices was to make your choice based on the references of your neighbors or friends, who had their interiors created by some specific author. This project was born right this way. The hostess of our today’s apartment visited her school friend and really appreciated the interior of her apartment. Her impressions were so strong that she decided to contact the author of that interior and ask her to decorate her living space. Her wishes regarding the future interior were formulated quite simply: “I don’t understand anything about interior design, but the most important thing for me is coziness”. However, there was one preference regarding the color scheme – the hostess is a devoted fan of brown color. Thanks to the creativity and skills of the author, this small (54 sq. m.) one-room apartment was turned into a cozy home including two full-fledged bedrooms (for the mistress and her school-aged daughter) and a sweet zone for receiving guests with no damage to functional aspects. The plan of the apartment is almost square-shaped, and the only load-bearing wall was between the ex-living room and the kitchen. For a start, the rest of the walls of this room were demolished to create two isolated bedrooms: one by the window – it’s almost square-shaped and serves as a kid’s room, and the other is windowless and plays the role of a master bedroom. The latter was, by the way, a little bit enlarged by means of the ex-hallway. To ensure proper insolation and aeration of the windowless bedroom, the walls between the adjacent rooms were equipped with an interior window with a one-chamber glazing unit sized 1.5m x 1.2m. When both rooms’ doors are open, you may check out how the decorative concept set in the kitchen zone is supported by similar themes in the bedroom interiors and how integral the entire space looks thanks to this. One more thing that brings all the rooms together is the color palette. This is especially vital for small apartments, since this trick is a powerful tool for making spaces appear visually bigger. 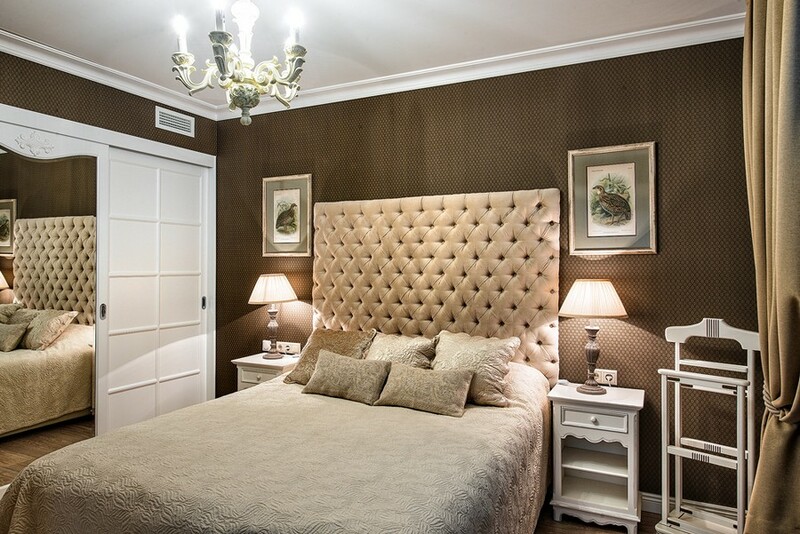 The combination of brown and white in finishes looks elegant and soft at the same time: saturated wall colors, light brownish-beige and creamy tones of floor coverings, white door paneling, classical baseboards and door slopes and elegant furniture create a very harmonious color balance. However, we must mention that the hostess was pretty suspicious about such a color range and was pretty afraid that such a solution would look too dark and dull. Especially, considering that the wall color in her room is the darkest in the entire flat. Fortunately, her fears haven’t materialized: white pieces of furniture and décor have literally lit up the room. A very important role in correcting the proportions of the windowless space was given to mirrored doors of the closet. It was custom-made from a sketch of the author of the project. Please, pay attention to the fact that only one of its doors is mirrored, while the two others are made from common painted MDF: such a solution was made with psychological comfort in mind. The top part of the wardrobe is dressed up with a carved cornice, which was also made on a furniture mill from the designer’s drawing. The wall section above the closet is equipped with an air grating. The centerpiece of the room is a fabulous tall bespoke capitone headboard. It’s quite massive look is skillfully softened by an airy floor-standing clothes rack. And a finishing touch is brought by classical-style bedside lamps, a gorgeous chandelier and wall arts depicting beautiful bids. In this project a hackneyed girlish pink color scheme was replaced with a noble beige and brown palette diluted with pure white furnishing and wall recesses. The new wall between the bedrooms was built up from foamed concrete blocks, plastered and covered with beautiful wallpaper with a delicate floral pattern. The flooring in both bedrooms is made from brownish beige laminate with clear wood grain. Given that the ceilings in this apartment are pretty low, they were just evened with plaster and painted. In general the interior of the schoolgirl’s room looks very elegant and light. A solid wooden desk with two cabinets is placed by the window, and a compact transformable couch turns into a full-fledged bed. The window is dressed up with classical drapery and complemented with a pretty neutral Roman blind. The cabinet furniture is diluted with a beautiful airy element – a gorgeous wrought whatnot in a wall recess. And the other recess is adorned with an artwork featuring a bird, which matches it with the mistress’ bedroom. Have a look at this apartment’s kitchen and bathroom in Part 2 of the post.